The Ether Dome is an amphitheater in the Bulfinch Building at Massachusetts General Hospital in Boston. It served as the hospital’s operating room from its opening in 1821 until 1867. It was the site of the first public demonstration of the use of inhaled ether as a surgical anesthetic on October 16, 1846. La Jolla Playhouse’s Mandell Weiss Forum has been transformed through Jim Youmans’ scenic design to portray that historic passage. Audience members witness how these men of medicine continued to search for the least painful way to surgically intervene. 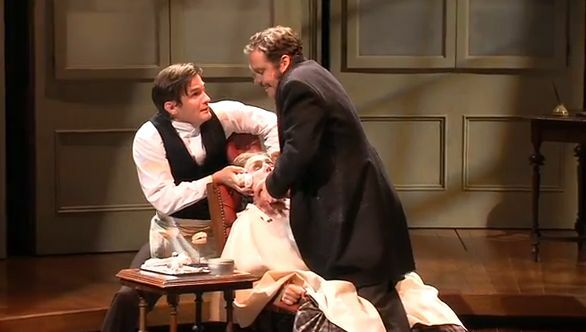 The play captures the circus like atmosphere that surrounded surgery during the mid-nineteenth century when both medical and non-medical staff offered various opinions on procedures carried out upon unanesthetized patients. Horace Wells (Michael Bakkensen) is a dentist with a reputation of having a very good ‘hand’ for surgery. After attending a public event with his wife and serving as guinea pig for laughing gas, he decides to utilize it during surgeries to experiment with painless procedures. As word begins to spread of Wells’ breakthrough, his apprentice and partner William Morton (Tom Patterson) decides to promote the maneuver and show it to the medical experts in Boston. Things do not work as planned and Wells leaves dentistry behind while the smoke clears, going to Paris as an art dealer. As he makes new friends overseas, he discovers other relaxing substances like ether. Back home, Morton continues searching for a better way to market and make money off of painless procedures. He becomes a doctor overnight and comes up with an anesthetic device (not his own) intending to patent it. He attempts to charm everyone, including wife Lizzie (Liba Vayneber) with an avalanche of scams but his dark tracks begin to show. The elder peers Dr. Gould (Ken Cheeseman), Dr. Warren (Richmond Hoxie) and Dr. Jackson (William Youmans) realize Morton’s scheming ineptitude far too late. The consequences have spun out of control. Richmond Hoxie’s passionate vocal portrayal shakes the dome in a strong, defined manner. Youmans provides nuance to his character. The play delineates the thin line between greed, success and recognition and how word of mouth, perception and acceptance influence societal attitudes. The creative team is also integrated by Costume Designer David C. Woolard, Sound Designer/Composer John Gromada, Sound Designer Alex Neumann, and Shirley Fishman, Dramaturg. Ether Dome will be playing until Sunday August 10th with various surrounding events like talkback Tuesdays, foodie Fridays ,Discovery Sundays and insider events with staff of the Playhouse that highlights the history and making of the production. Tickets start at $15 dollars. « Is Marriage Becoming Obsolete for Millennials?